Bayelsa has recently become notorious for cult killings and even 'one chance' robbery at a time that flood waters have sacked many from their homes. On the other hand is the activities of oil thieves who vandalise pipelines. 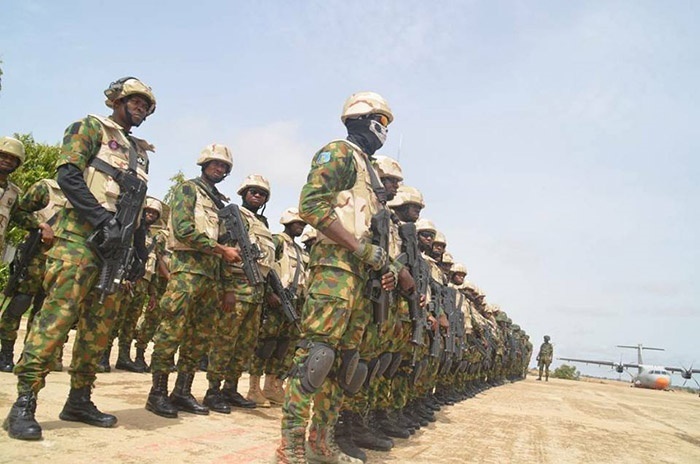 To stem the tide, the 16 Brigade of the Nigerian Army on Friday commenced 'Operation Crocodile Smile III’ across some states in the oil rich Niger Delta. The General Officer Commanding (GOC) 6 Division, Port-Harcourt, Major General Jamil Sarham, said the 2018 operation would not be different, as officers and soldiers had been advised to abide by the rules. Sarham said that professionalism would be showcased during the operation in the states under the division - Akwa Ibom, Bayelsa, Delta and Rivers. He commended Governor Seriake Dickson of Bayelsa for providing the needed support to the army and other security agencies. Also speaking, Brigadier General Kevin Aligbe, the Commander, 16 Brigade, Nigerian Army in Yenagoa, said the operation was being conducted under the directive of the Army Chief of Staff. "In line with the Army Headquarters Training Directive for Year 2018, we have commenced preparations that started on Oct. 22, with multi-agency show of force within Yenagoa metropolis and beyond. "Today, we have gathered here at the second army headquarters Nembe for the flag-off of our engagement to dominate the water. "In doing so, we are very much aware of the expectations of the GOC, Chief of Army Staff and the general public of our conduct during period of operation," the Commander said.